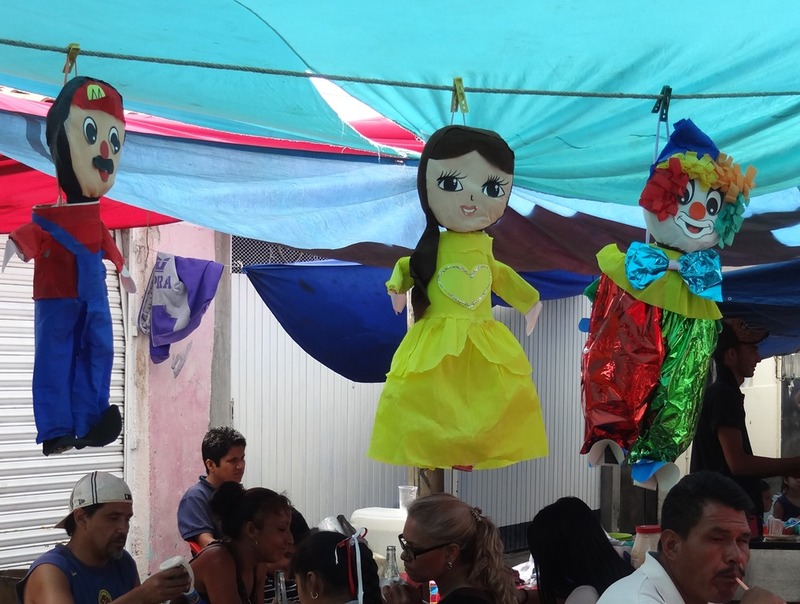 « Who is La Catrina? 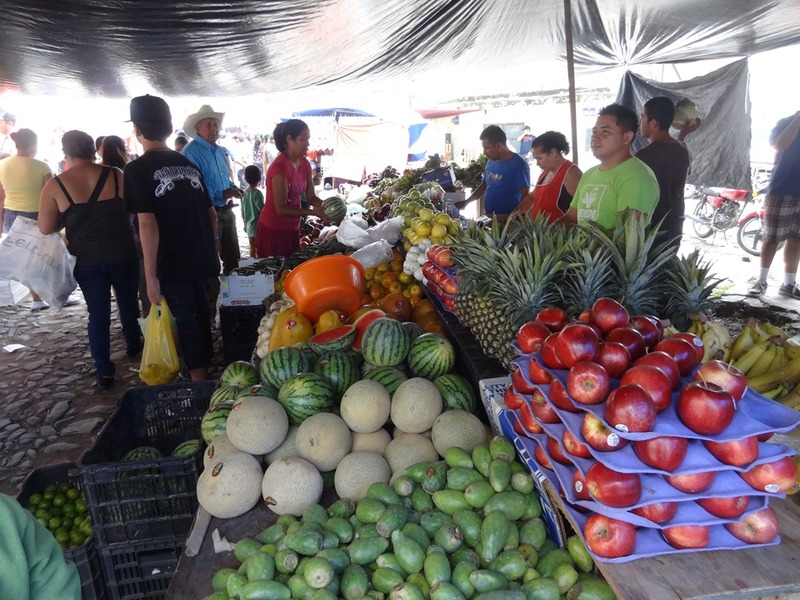 In Mexico, open markets are called tianguis in Spanish. 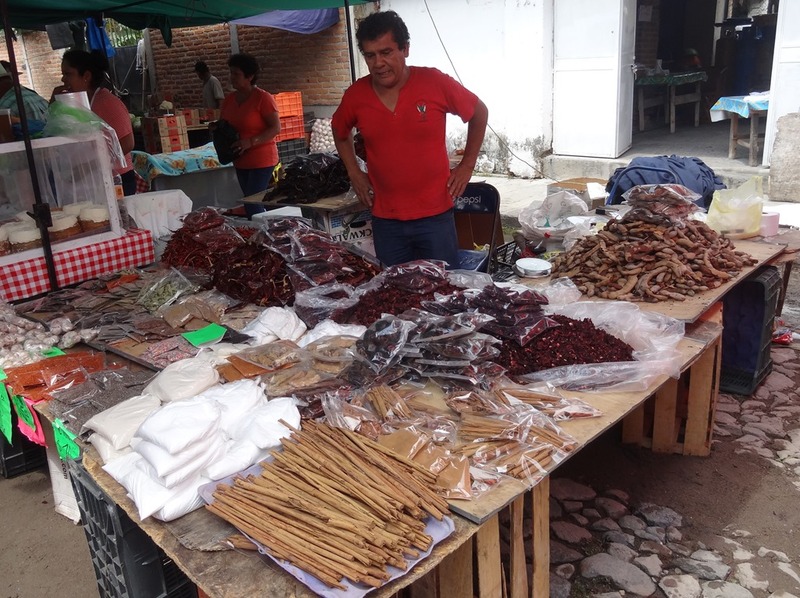 The tianguis (tianguis is both singular and plural) is the traditional market that has existed in Mesoamerica since pre-Hispanic times. 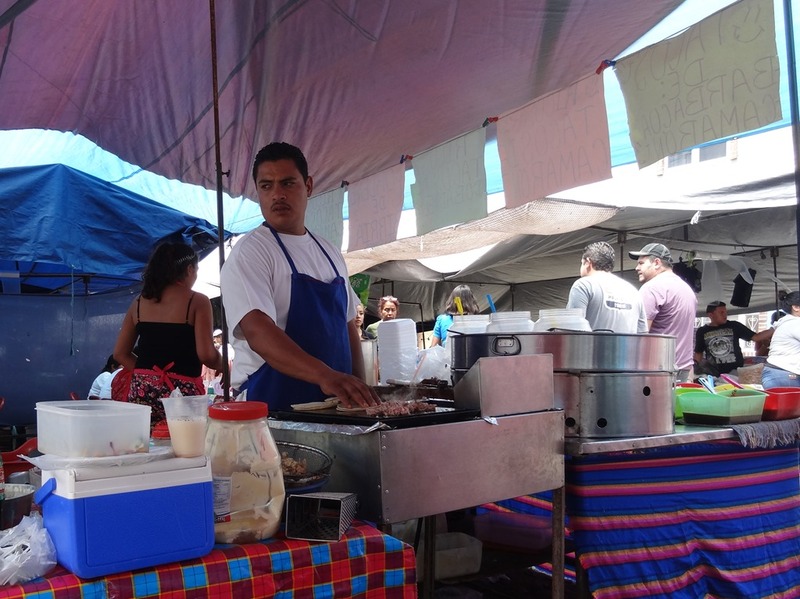 The word tianguis comes from Nahuatl tiyānquiztli. Nahuatl was the language of the Aztec Empire. 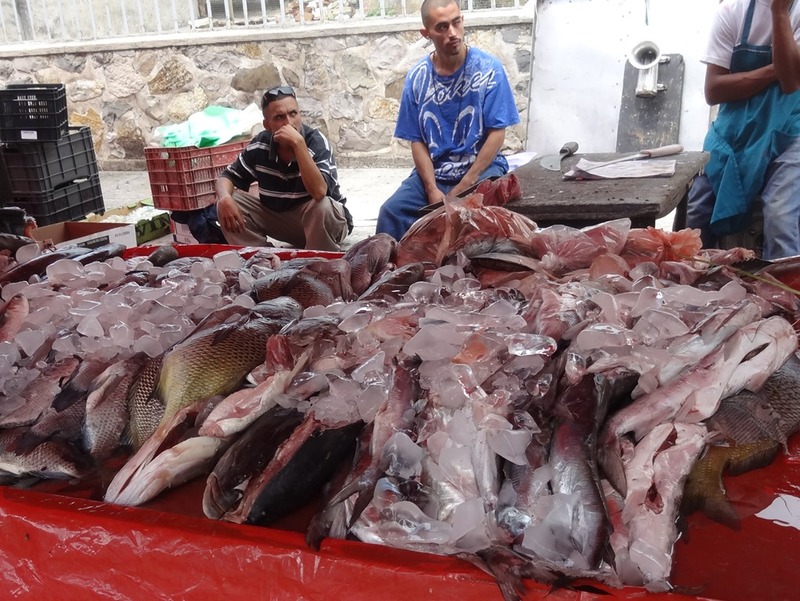 This shows the ancient origins of this traditional market. They usually are held in fixed locations on a specific day of the week. 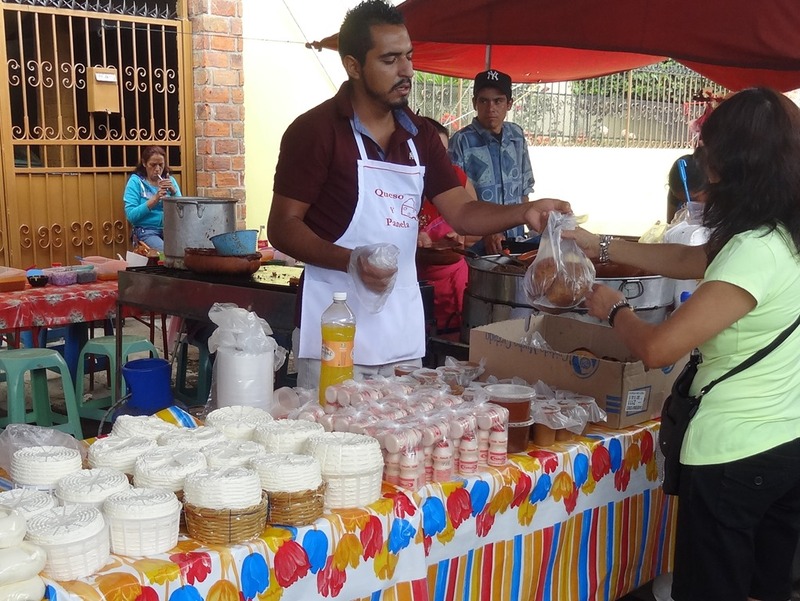 We have two tianguis in the Ajijic area, Monday in Chapala and Wednesday in Ajijic. 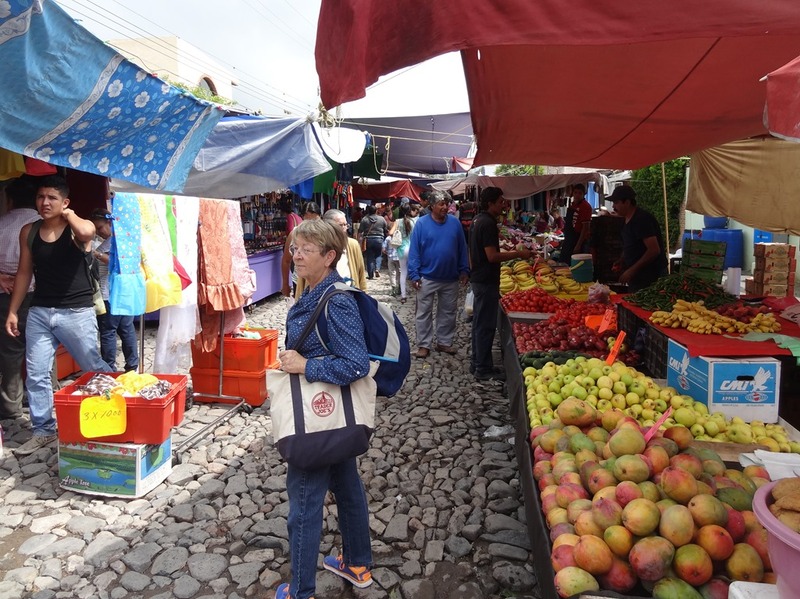 There is an organic market in West Ajijic on Tuesdays, attended mostly by Gringos. 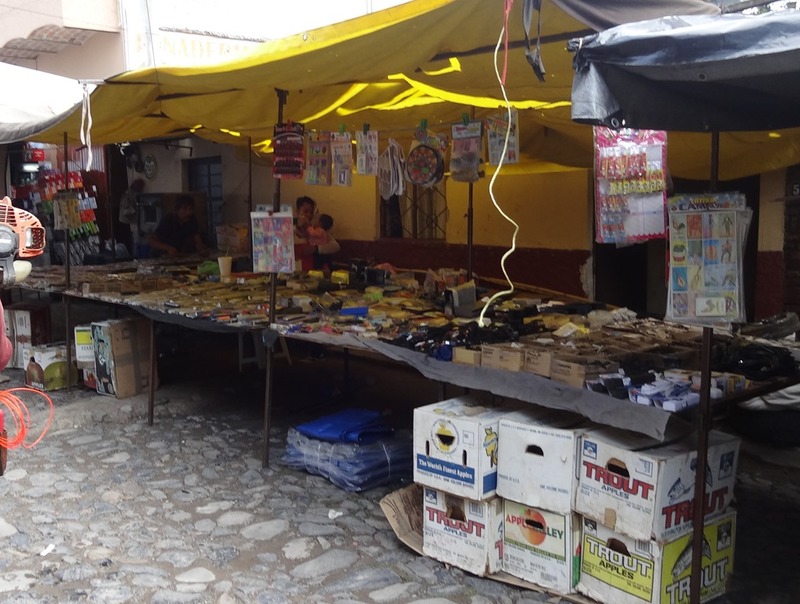 But since it is held inside a building, it is not a tianguis, but rather a mercado. 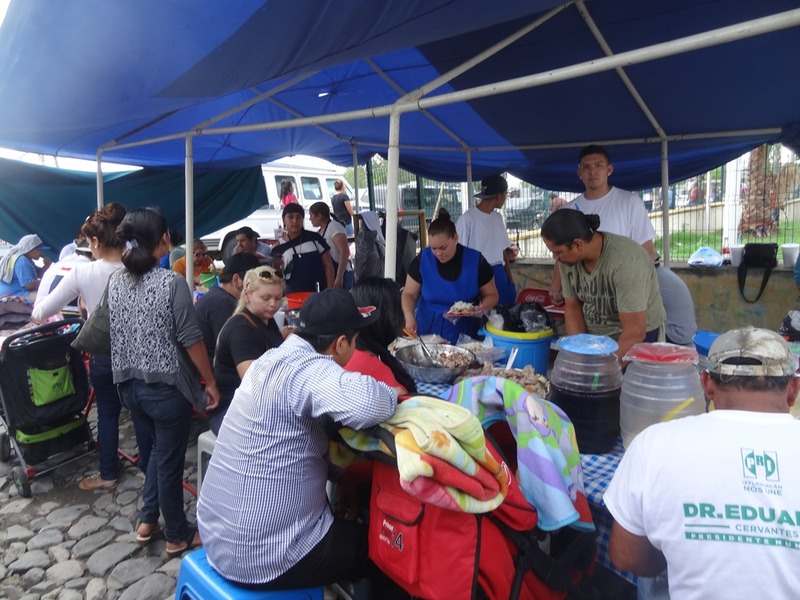 The Wednesday market has its share of both Mexican locals and Gringos. 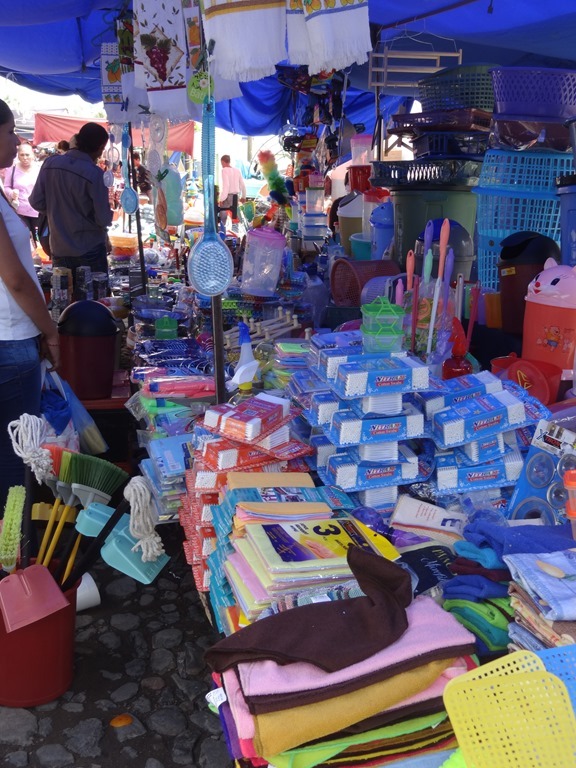 The Monday tianguis in Chapala is different in that it primarily serves Mexican locals. 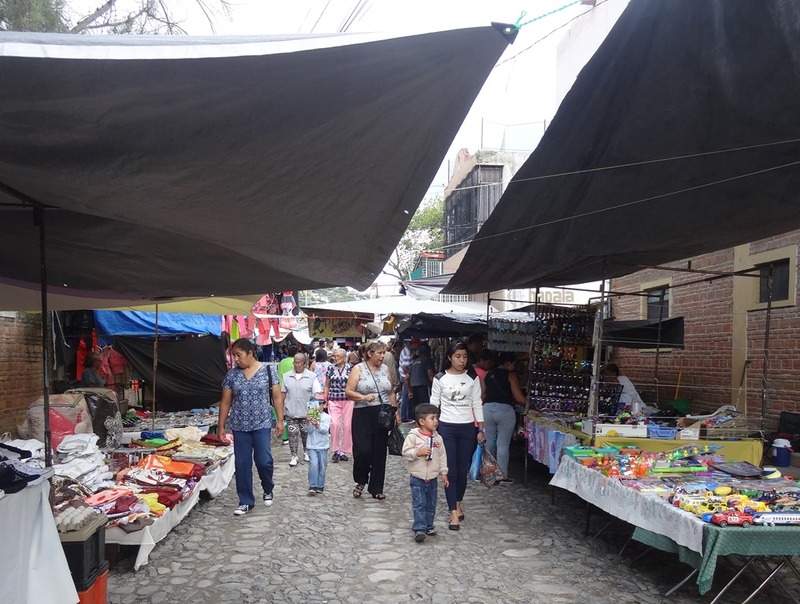 As such it is more similar to the traditional Mexican tianguis than the two Ajijic markets. 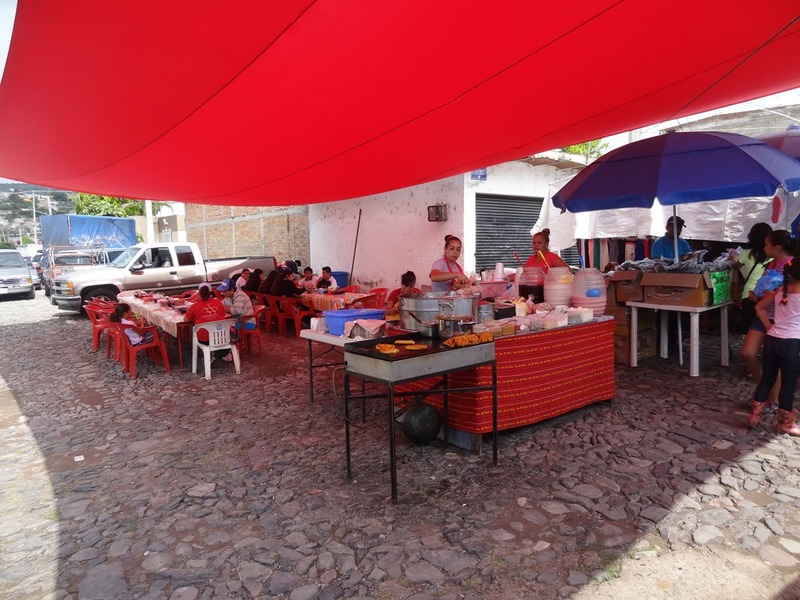 When you enter, you see covered eating areas, the first of many food stalls in the market. Lots of people are eating here. 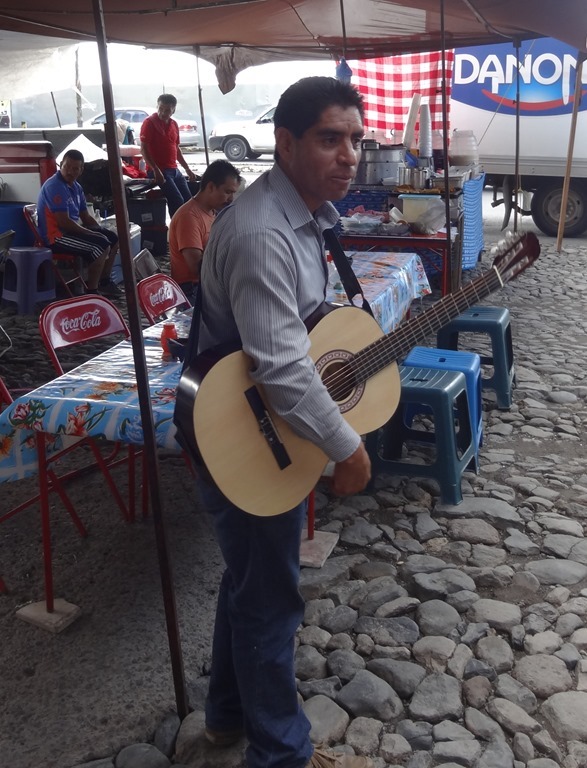 A musician, following another long tradition, playing music on the street for donations. 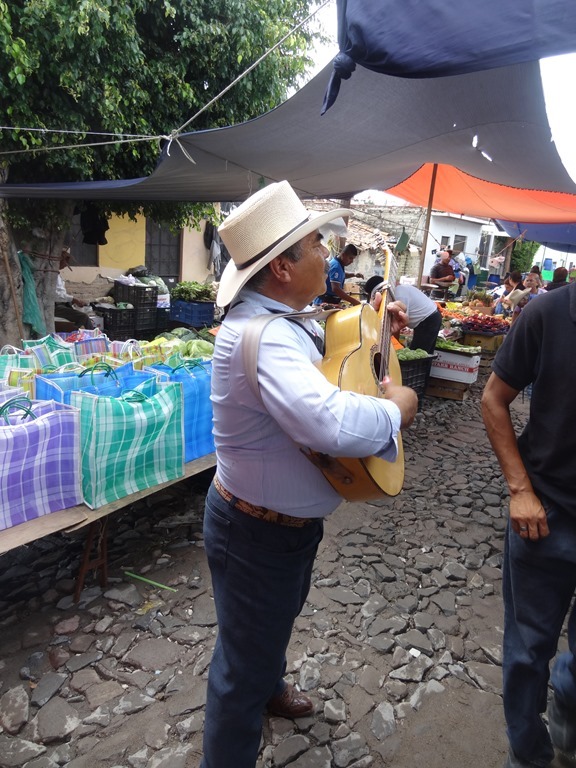 Mariachi music originated in Guadalajara, after all. The stalls are mostly covered against the sun and the rain. 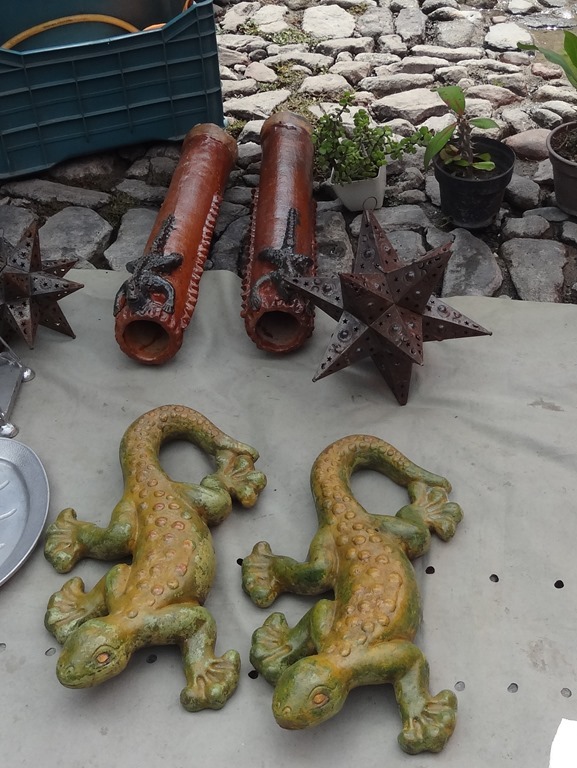 Brightly colored items line both sides of the walkway. 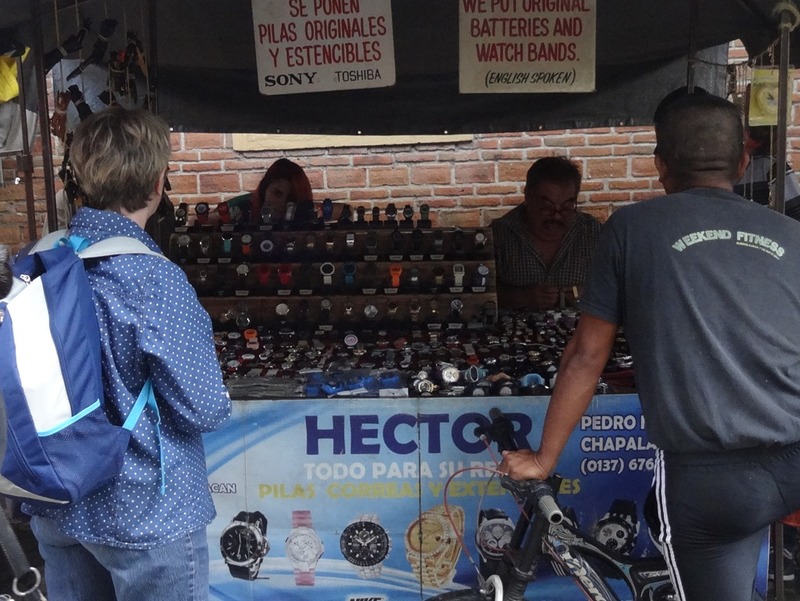 There are several watch vendors. Shelves of small electrical items and parts. Carol stands in the midst of it all, not knowing quite what to look at next. She’s carrying her casco, “motorcycle helmet,” in her backpack. 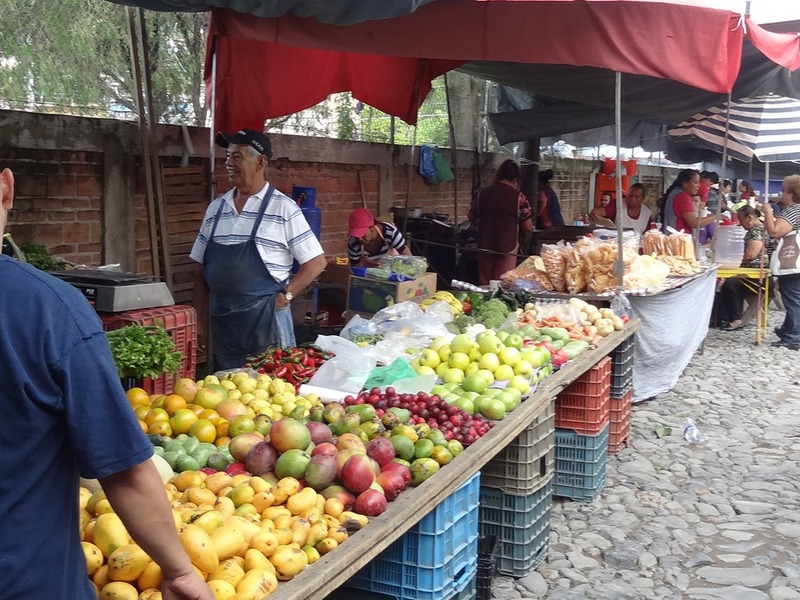 There are many fruit stands. 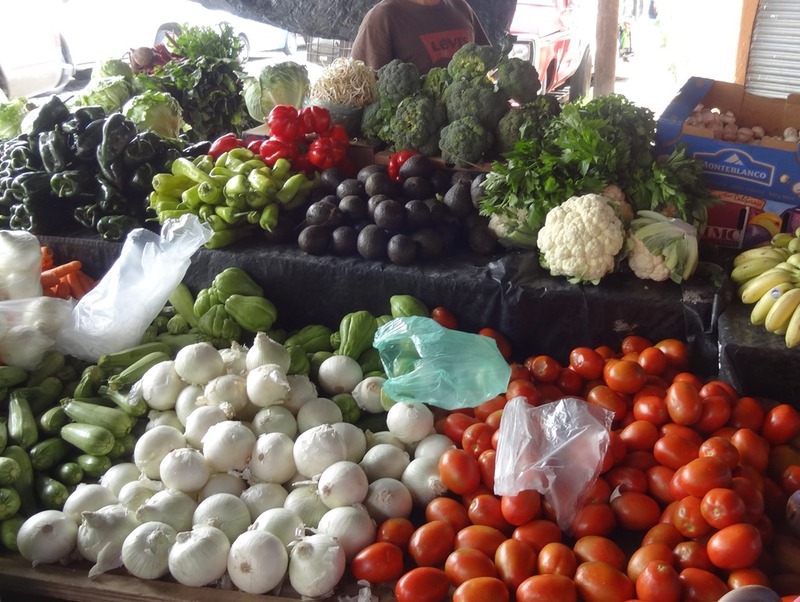 I think if you are a local this might be where you would buy fresh produce. 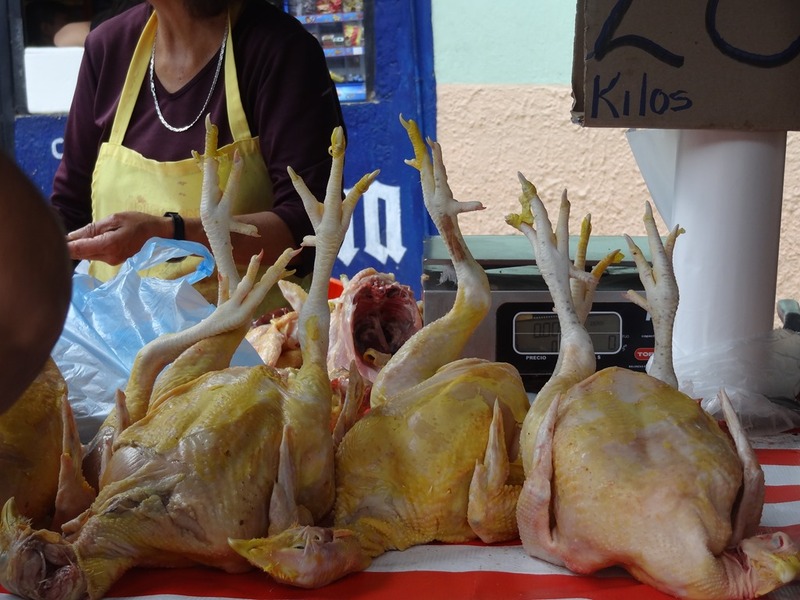 Fresh chickens, with their yellow feet still attached. 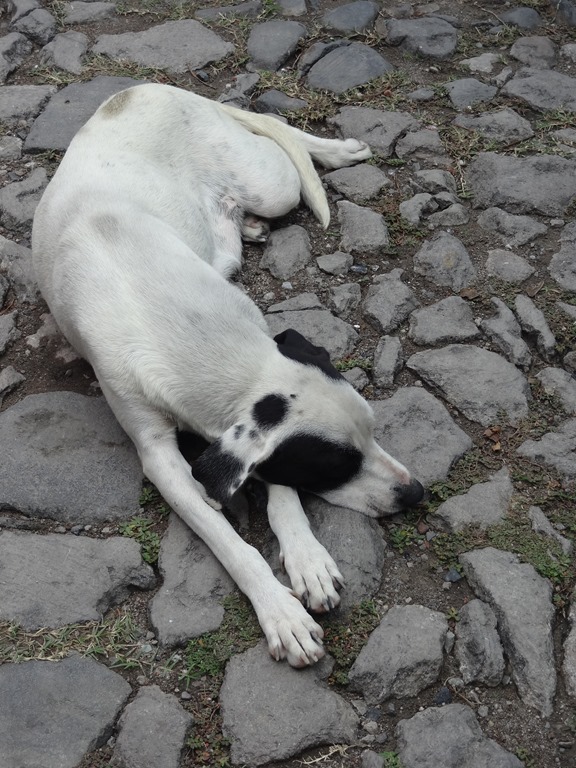 In the middle of everything, this dog can sleep. 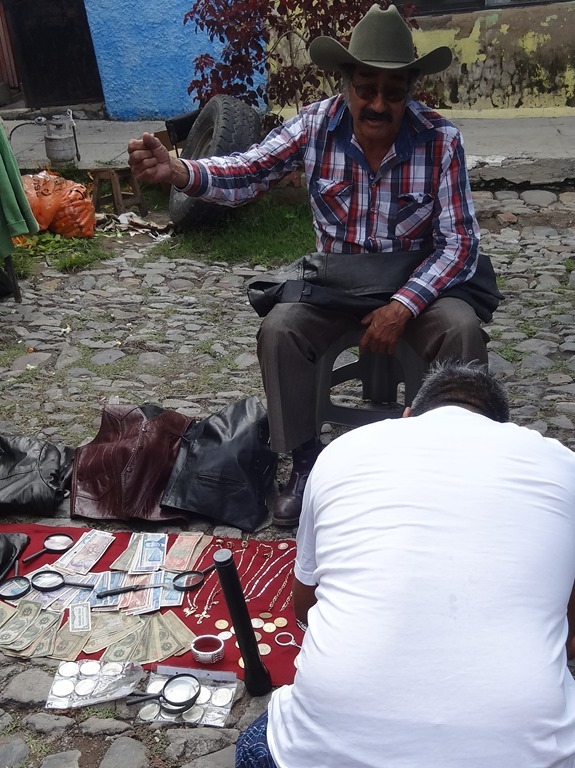 One man was selling coins and old money, his merchandise spread on a cloth on the ground. A customer is kneeling, intently looking at something. 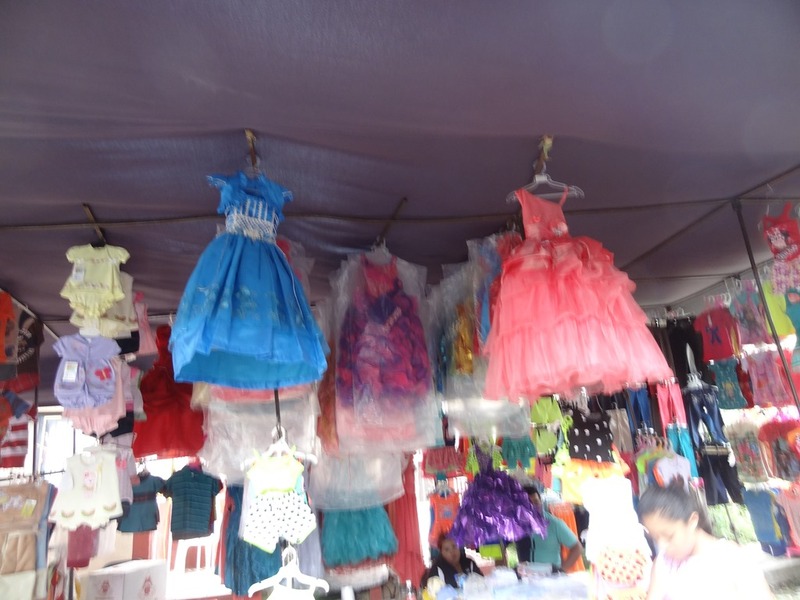 I think of these as princess dresses for little girls. They had princess dresses in India, too. 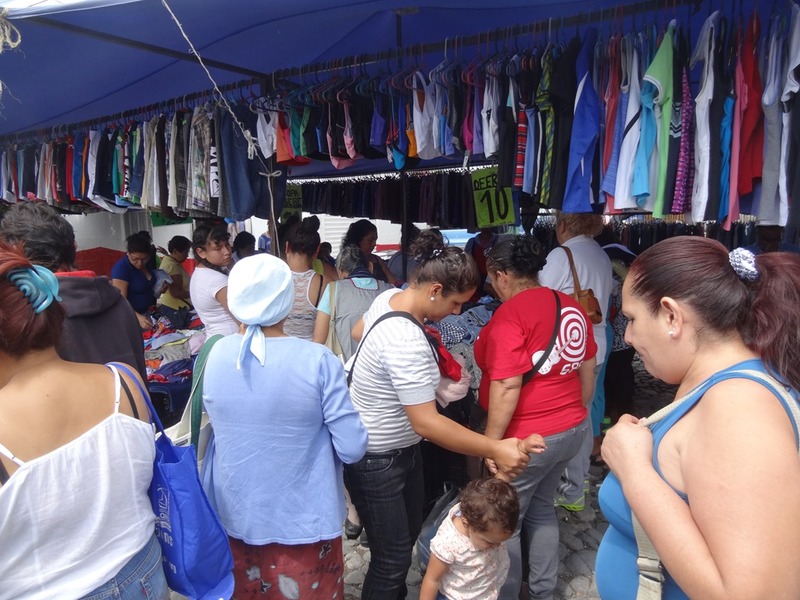 Clothing is another thing with many vendors have here today. Especially women’s clothing (and some for the kids, too). 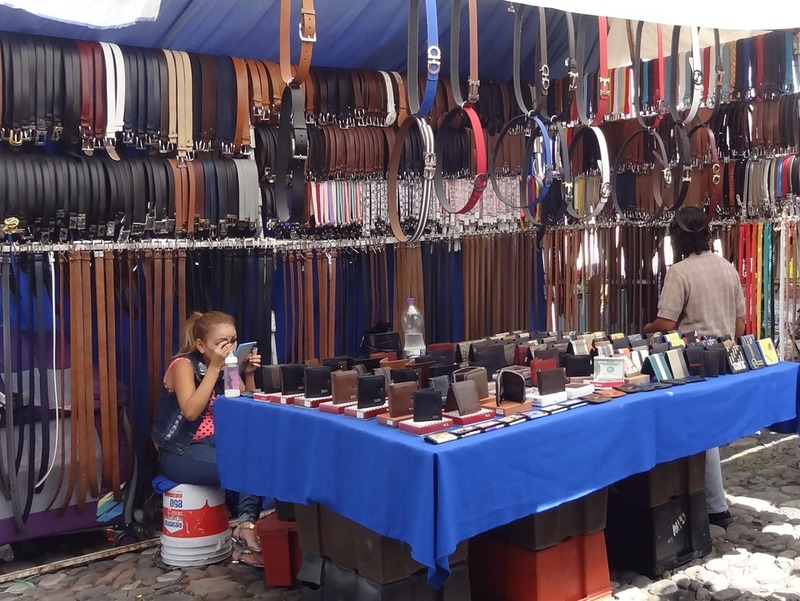 Not much for men–hats and belts and a table of short pants. I am not sure what these are. Carol was curious enough to reach out and touch. 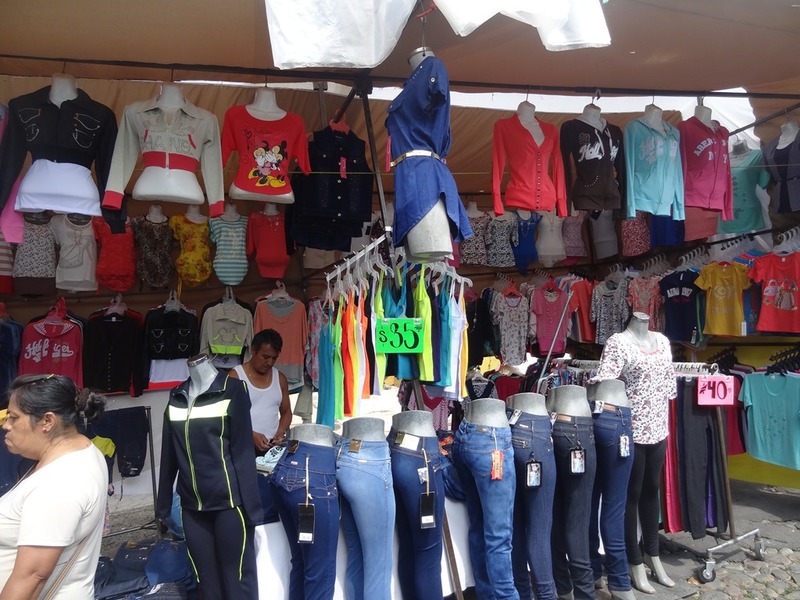 More women’s clothes. 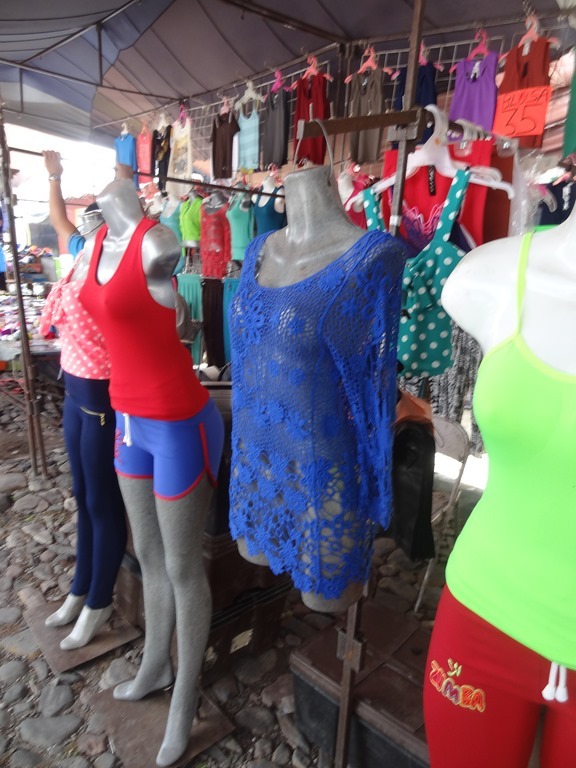 The blue lacy thing is something a Gringa might wear. 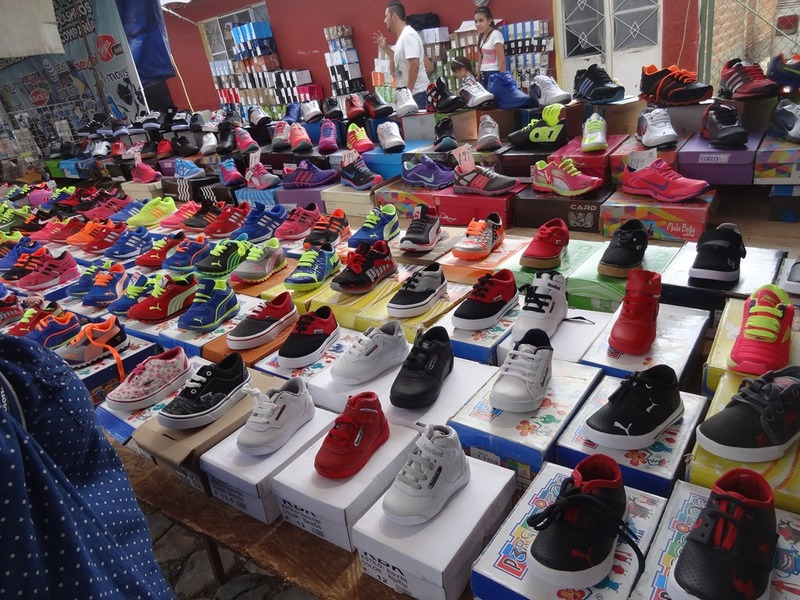 Shoes, mainly athletic shoes, nicely laid out. They are labeled with Nike and Adidas logos. Hmmm…. 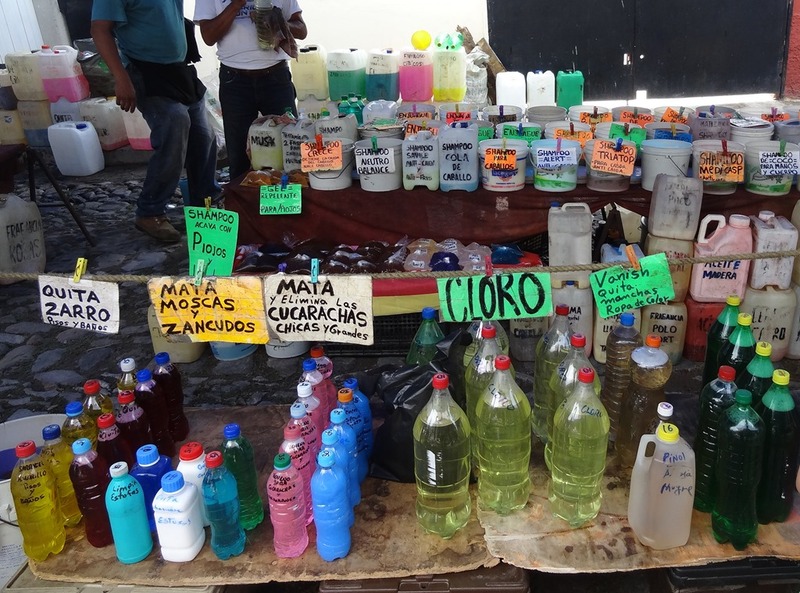 I had not seen this before–bulk house soaps and chemicals. No-label products. Some are in big buckets. 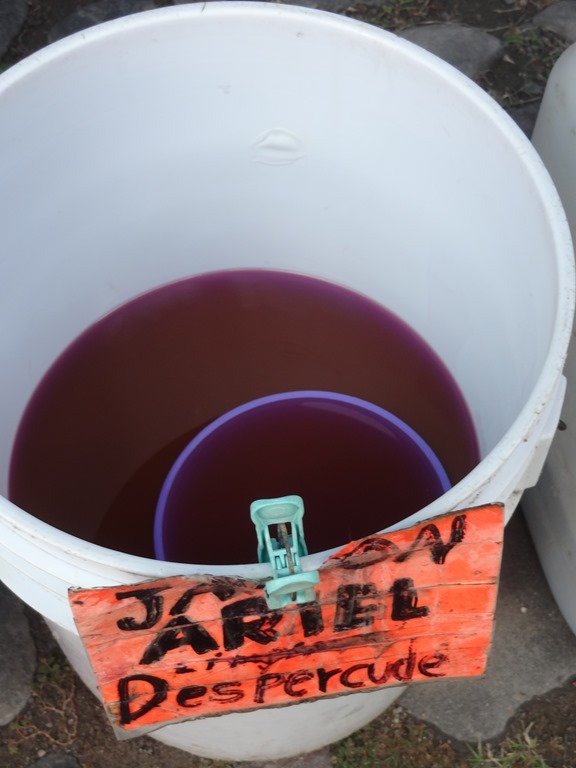 Come fill your bottle. Another food stand, many chairs, not too many customers. Kids’ things, hanging from a line. I don’t know enough about how local people actually live to know how these are used. 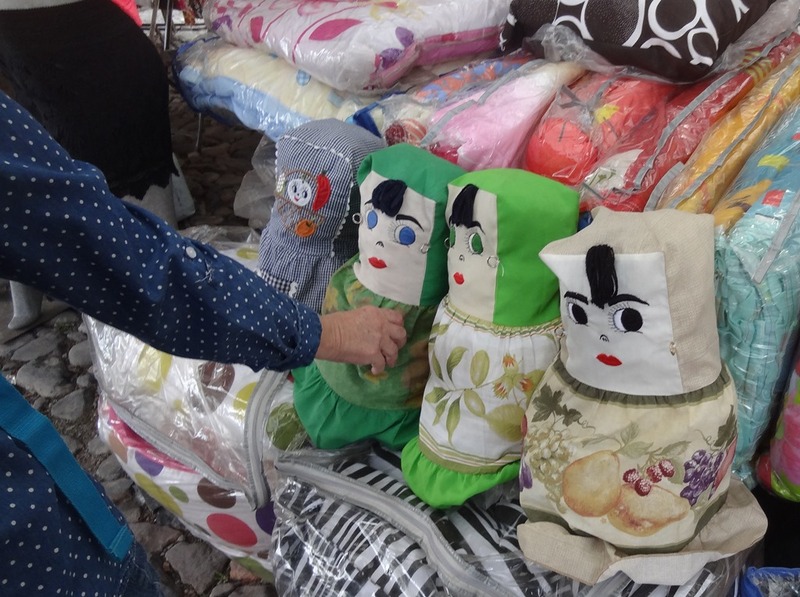 Are they dolls? 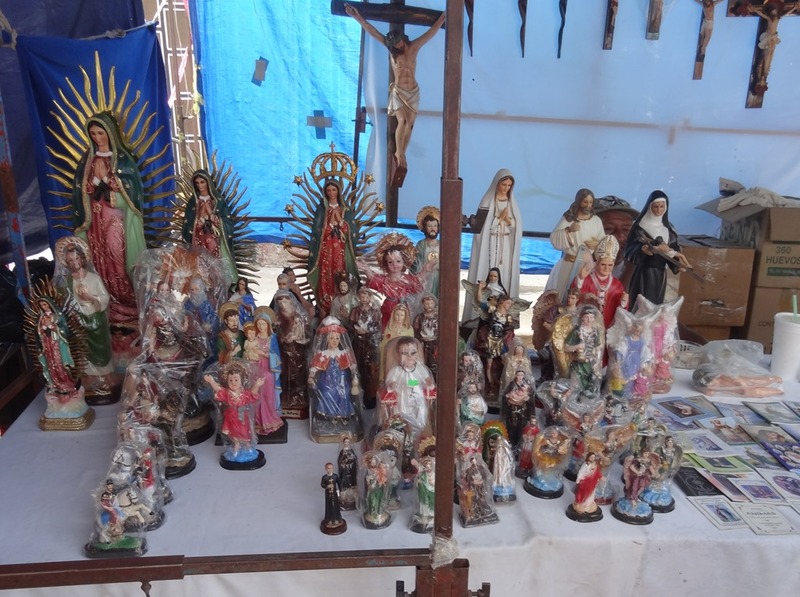 A table full of holy statues, mainly Our Lady of Guadalupe, I think. 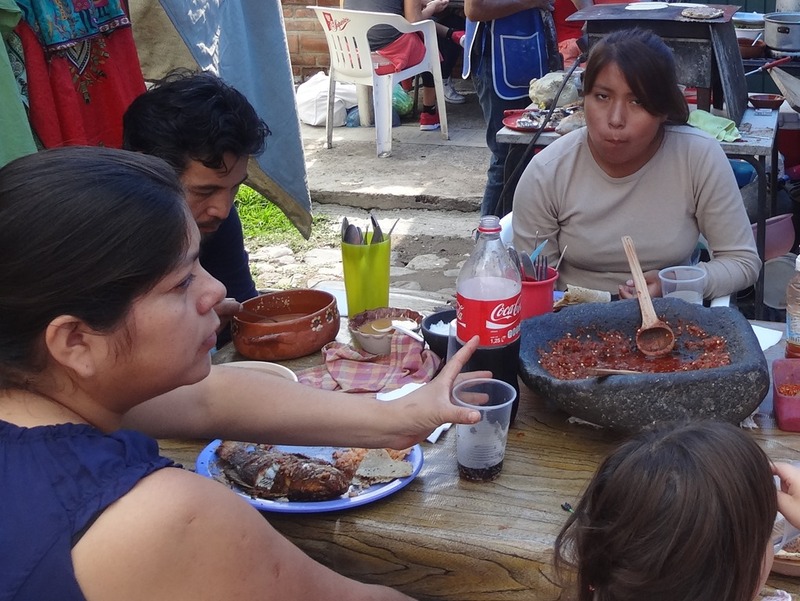 A family eating together. Note the big stone salsa bowl. 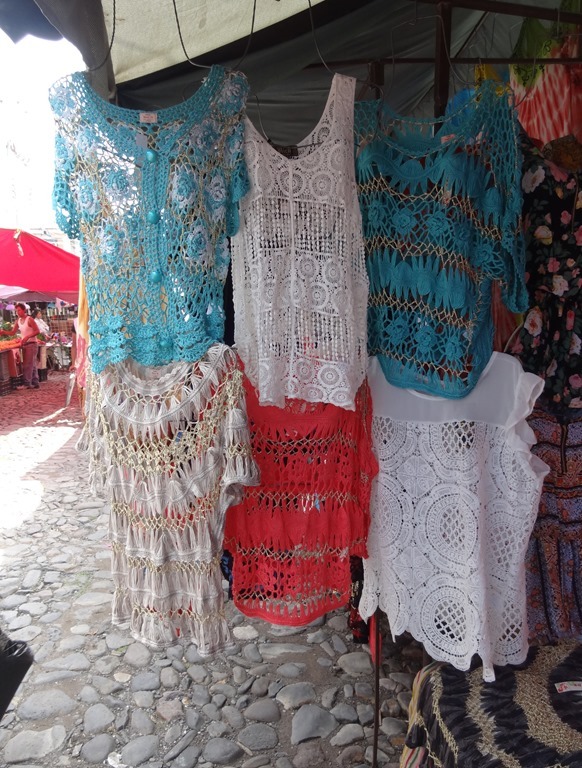 More lacy women’s tops. Where are the Gringas to buy them? 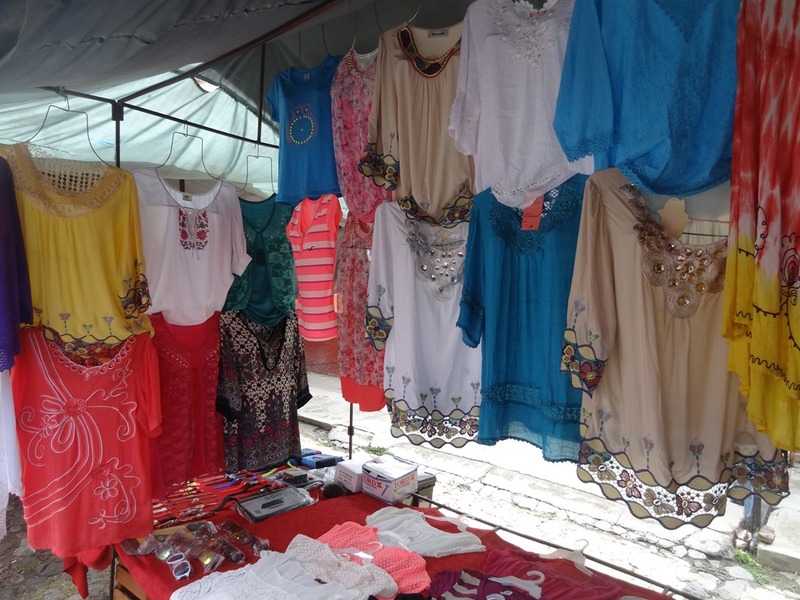 Many loose fitting women’s tops. 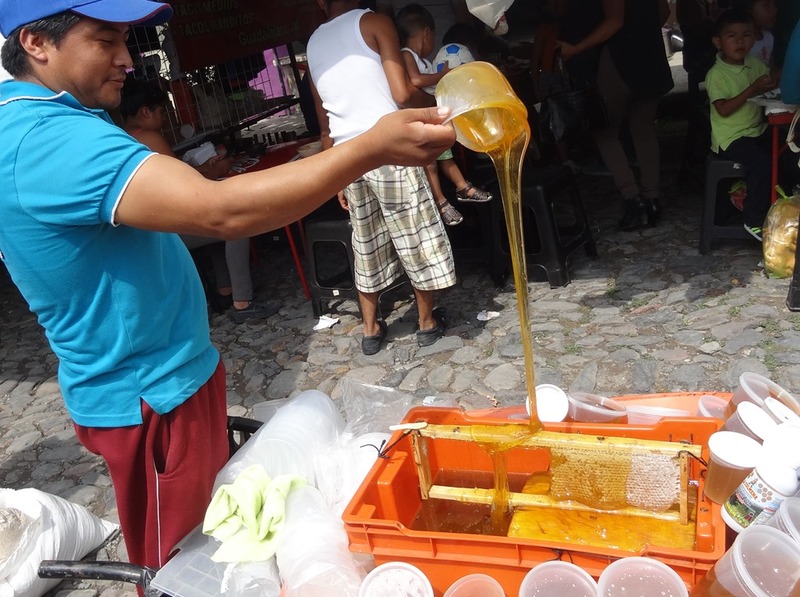 In the middle of the street a honey vendor with his special honey cart displays his wares. More tables with fruit piled high. I think these are barbeque tacos on the grill. 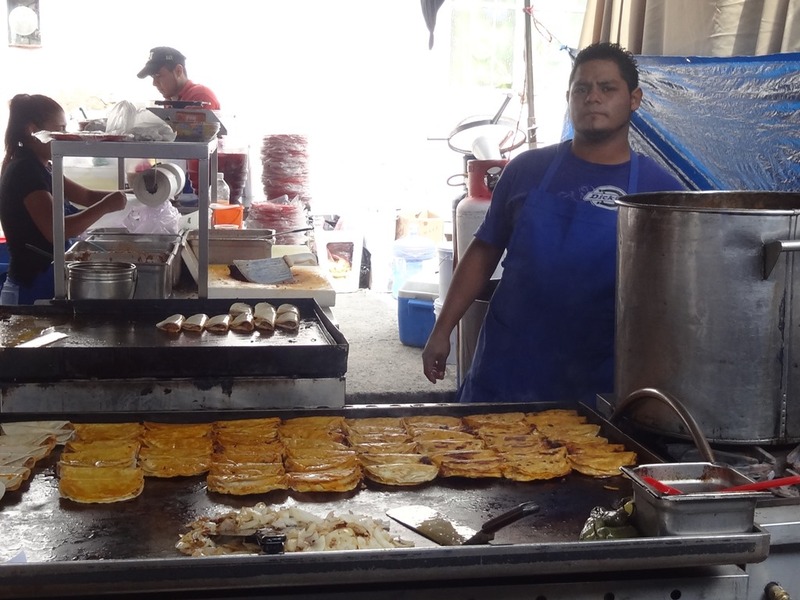 We had one elsewhere and it was great–soft, warm, moist, maybe melted cheese and meat. Yum. I saw three flower stands today. The flowers we got here are still fresh in our house. 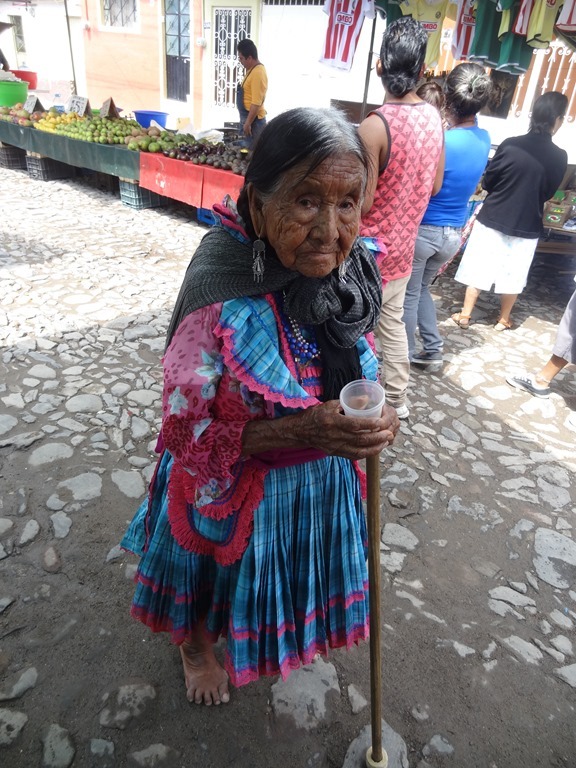 There were several old people in the crowd, selling small things for kids, or maybe just begging. 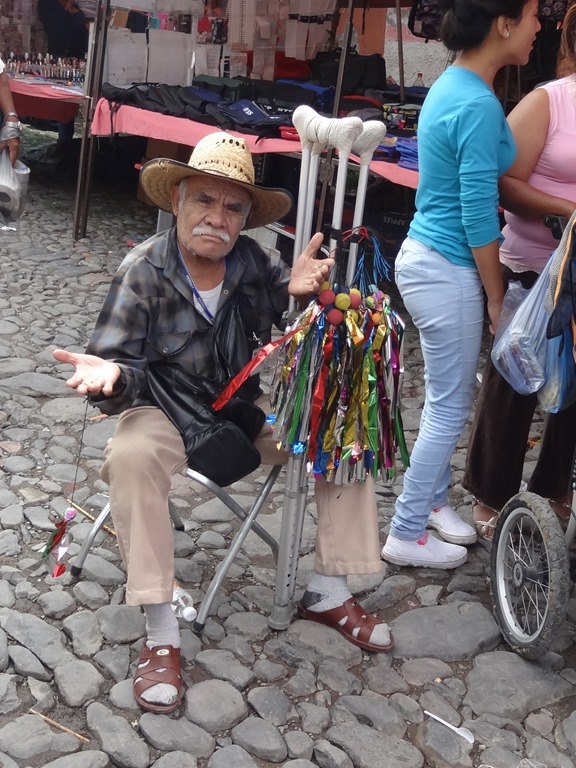 Though he is selling something, his hand is sure out asking for a donation. Many booths for women. 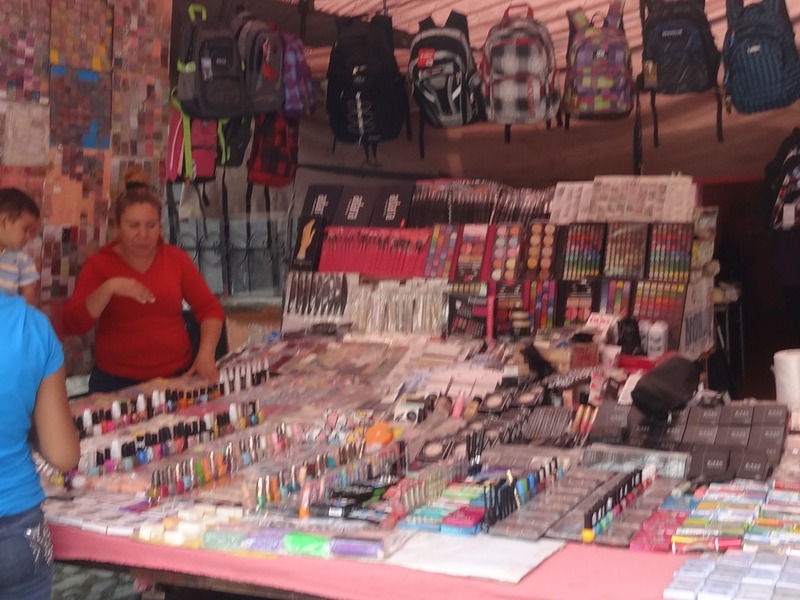 But not nearly so many jewelry booths as the Wednesday market in Ajijic. 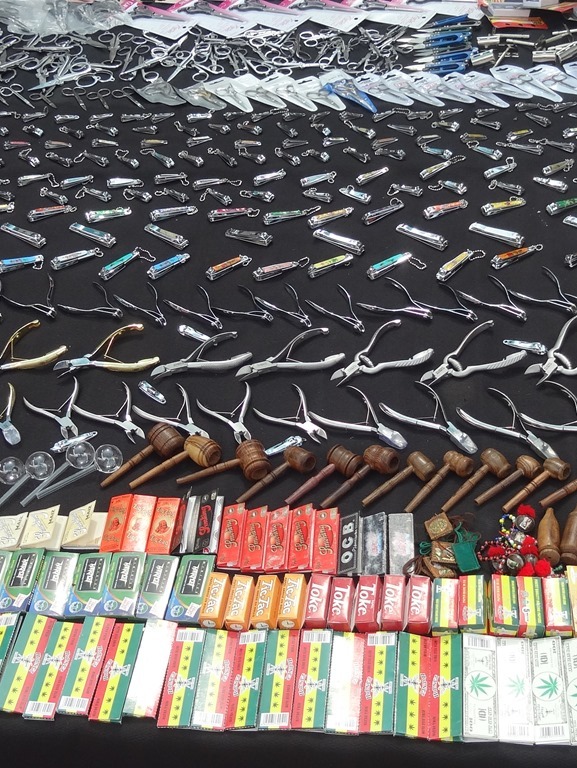 Rolling papers and small pipes are in the front of this display. 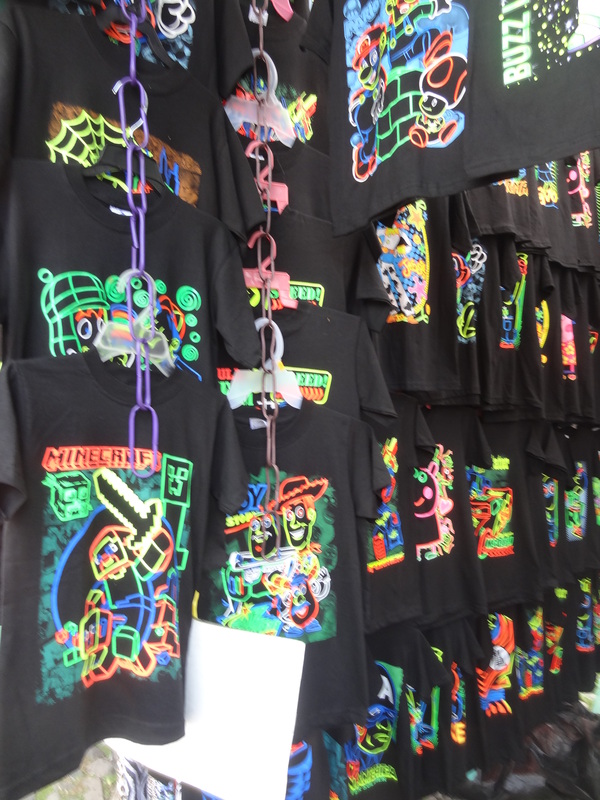 If this is not a Gringo market, then who buys all these? More veggies. They look good, but are not organic, probably. 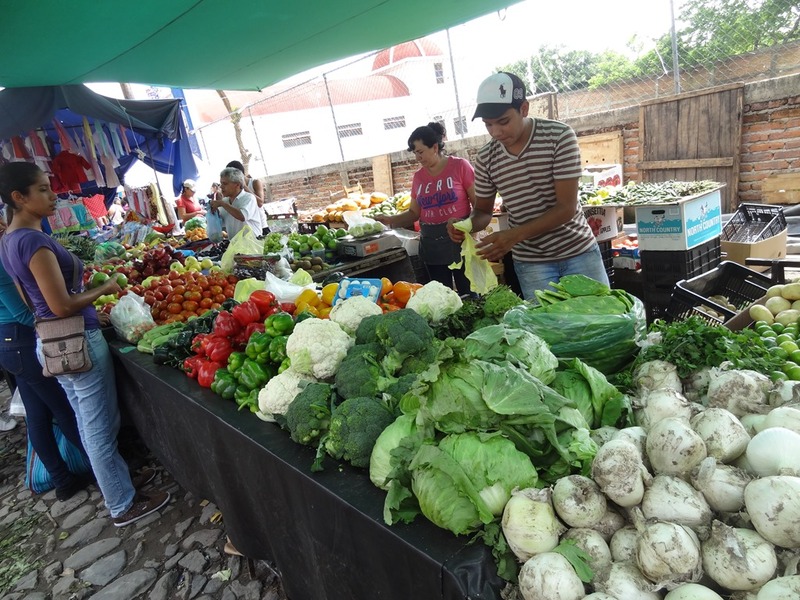 So the Tuesday market in Ajijic is better for organic. An old woman with her cup out. Her dress looks more native Indian than the younger women. I wonder if this is part of the local old woman beggar idiom? 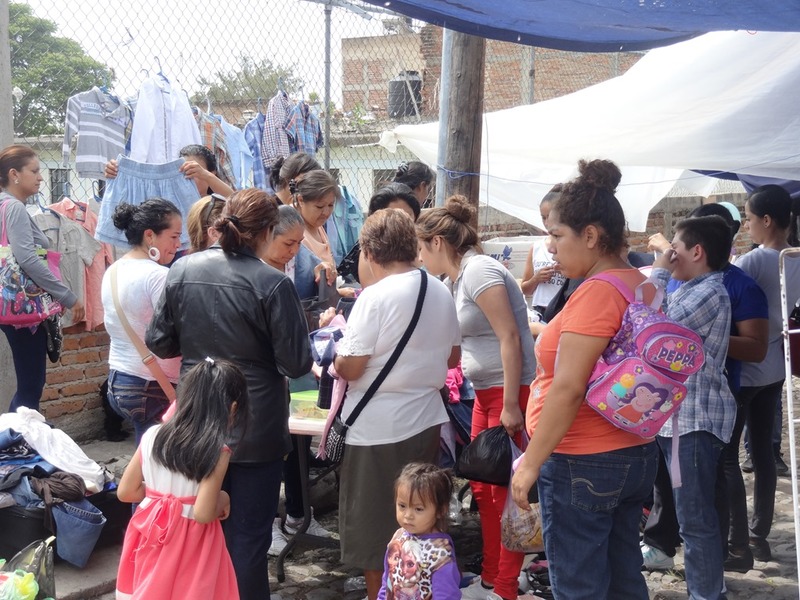 There are a few tables with crowds of lady shoppers, clawing though a pile of clothes, looking for the right thing. Two boys look at the baby ducks. A big plastics booth. We got a flyswatter, the first we’d seen here. 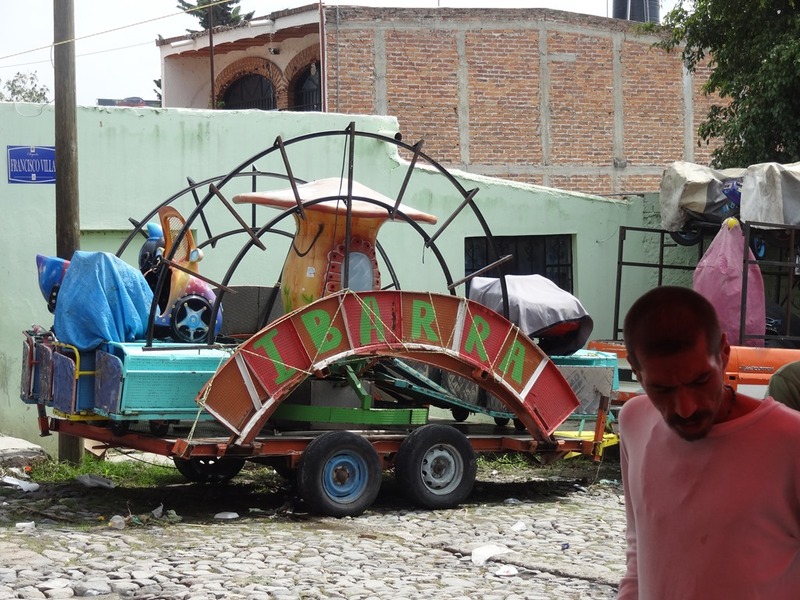 On the road, a part of a kid’s amusement park ride sits by the side of the street, waiting for the next place to set up. 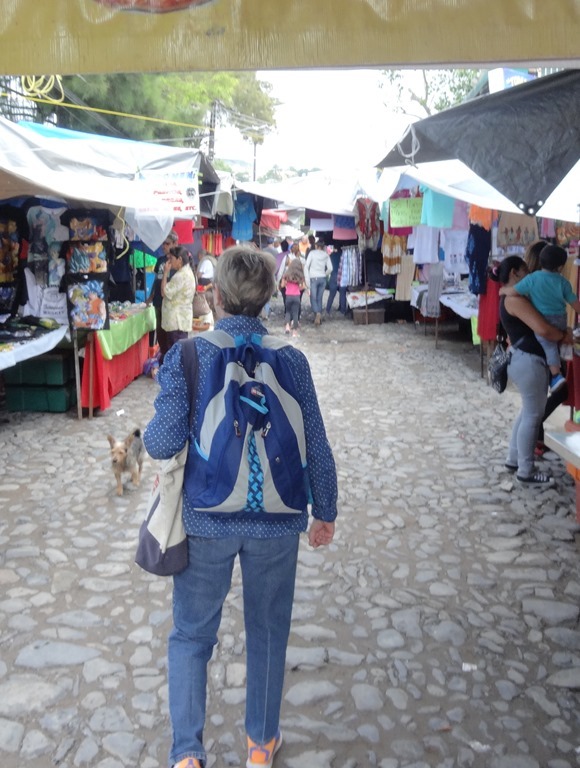 Carol enters another block of stalls. Notice the cobblestones that pave most of the streets here. 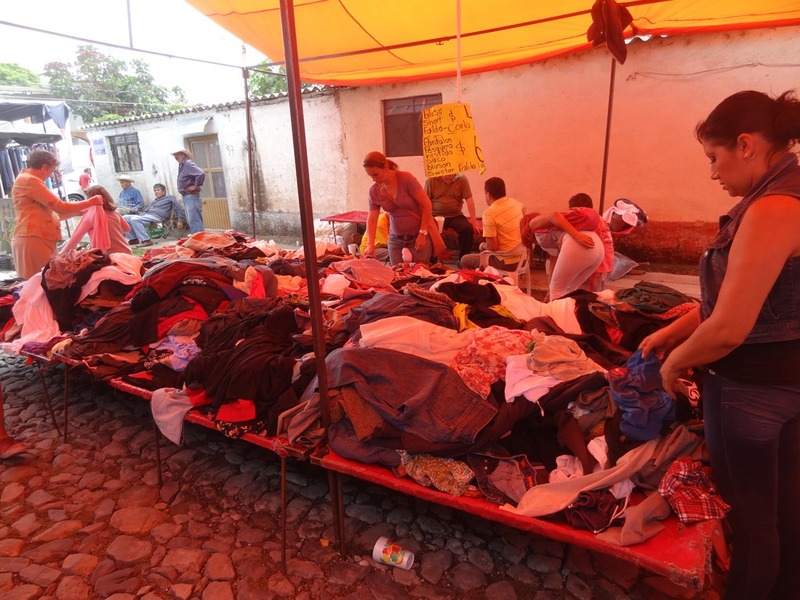 More piles of clothes, cheap. 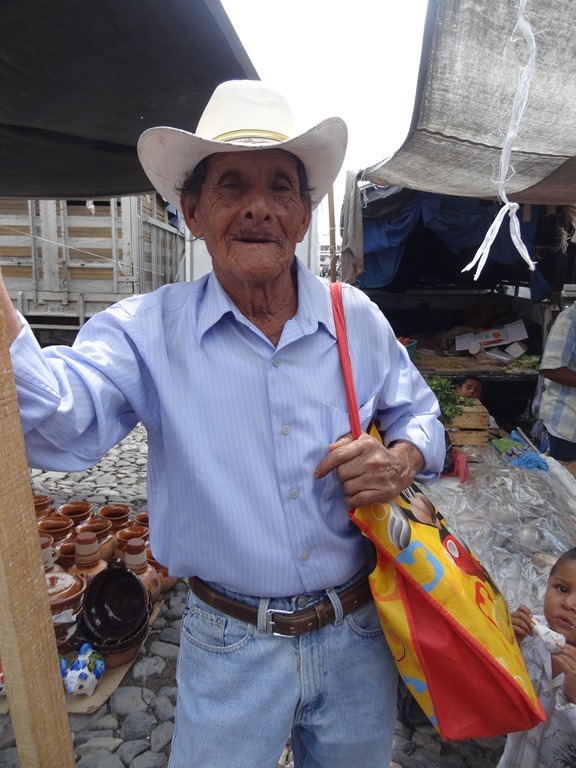 And old man standing with his bag. On his shoulder was a bag that featured Mickey Mouse. Carol couldn’t stand it any more. 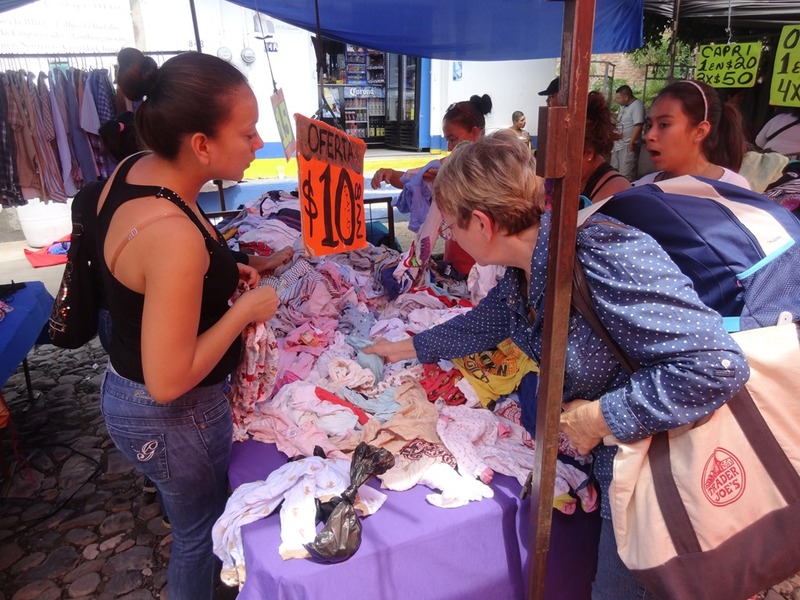 She saw a pile of baby clothes, 10 pesos each. She dived it! Only after we got home did she notice that they are used and some had holes in them. 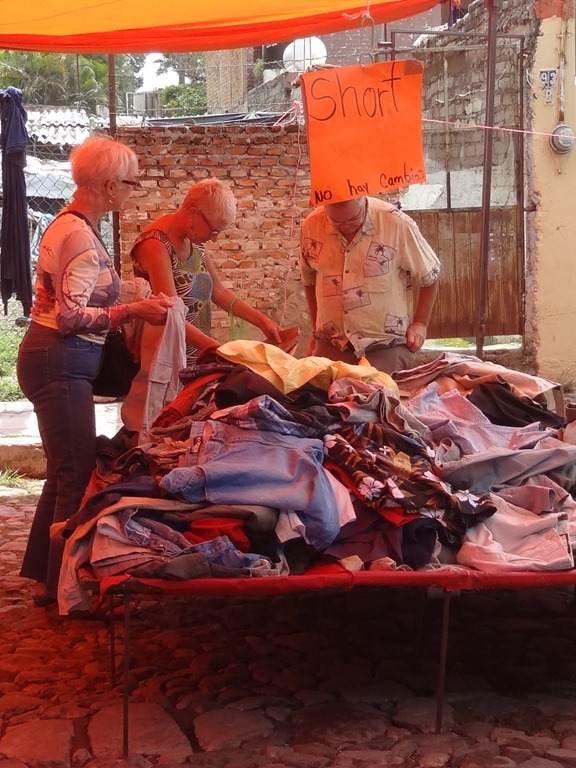 Maybe all these cheap piles are used clothes? We did see three other Gringos this day. They were all standing by the men’s shorts table. You might notice that the man in back is trying on a pair. More animals, bunnies this time. 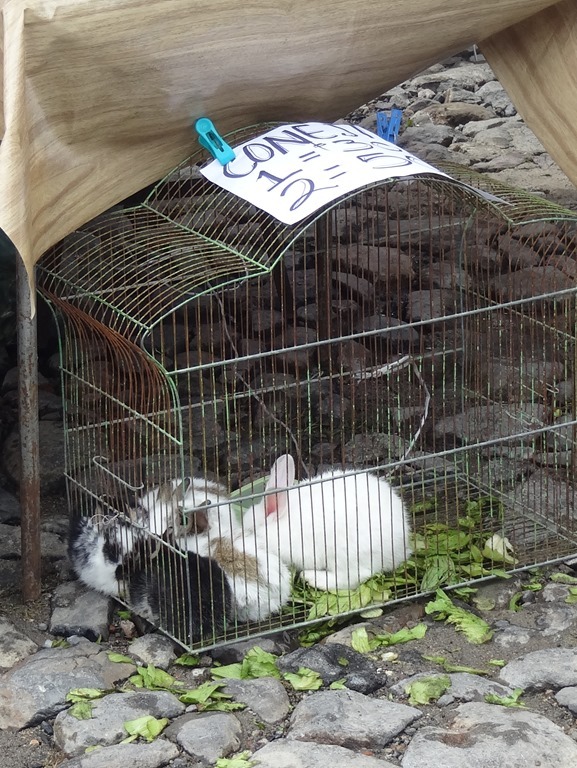 We saw a boy, maybe 8 years old, holding a bunny on the way out of the market, his smiling mom behind him. 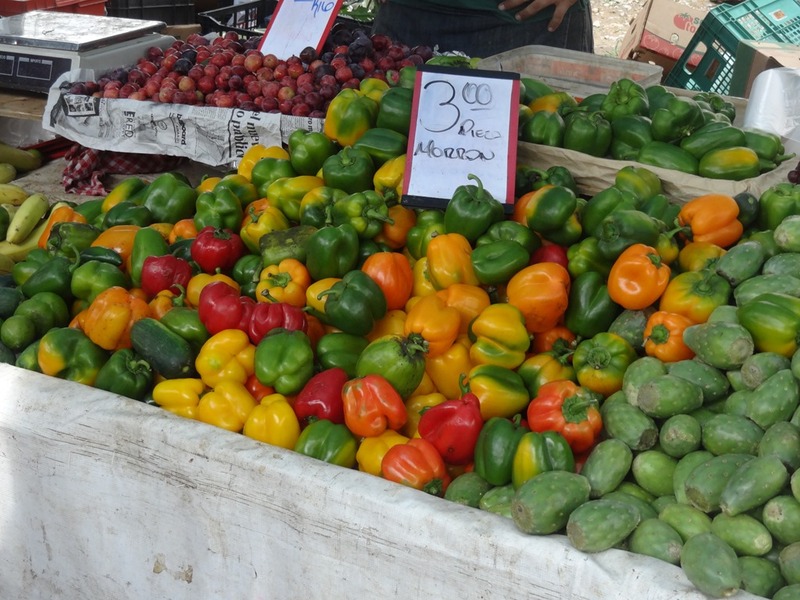 Red, yellow and green peppers. 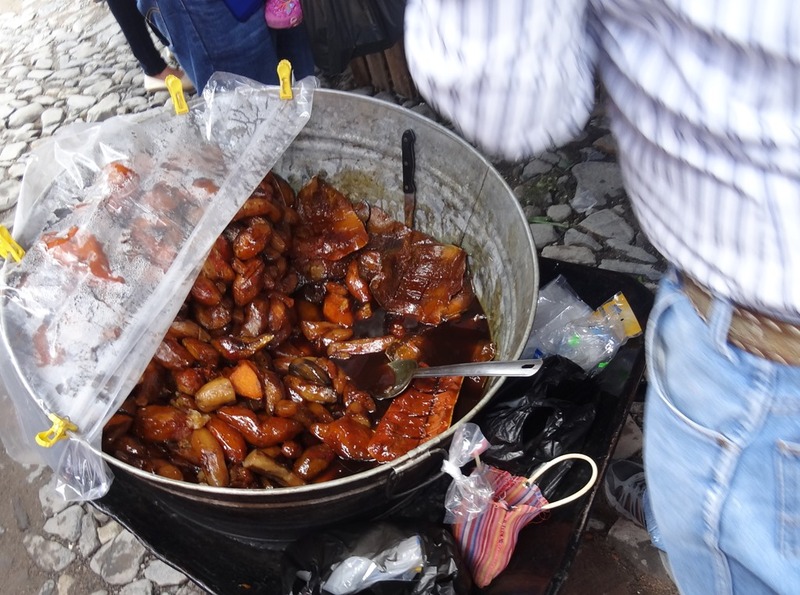 An old man was rolling a big bucket of brown sticky-looking things and selling them. Some kind of sweet, I imagine. Carol thinks this is a pot of candied squash of some kind. A spice table piled high with loose spices. See the cinnamon sticks, canela, in the front of the table? 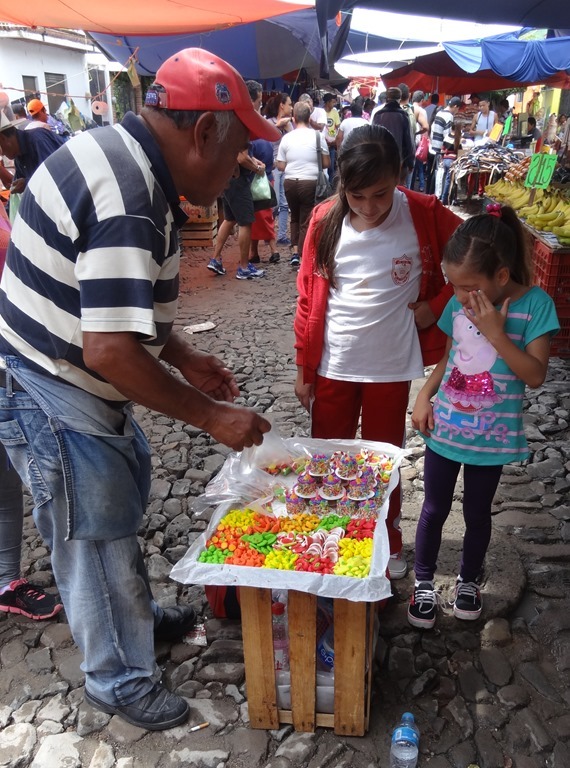 Colorful sweets for the kids. Lots of fruit if you want something healthy to eat. 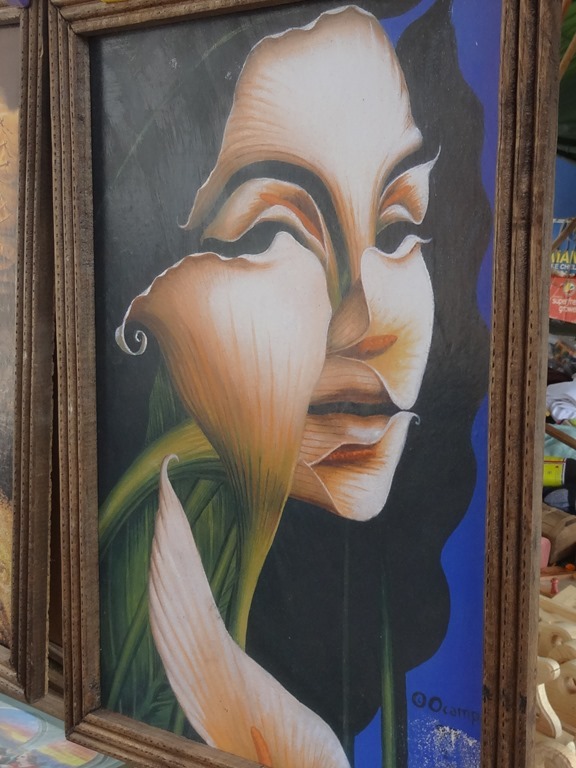 A painted face, formed of painted lily flower petals. 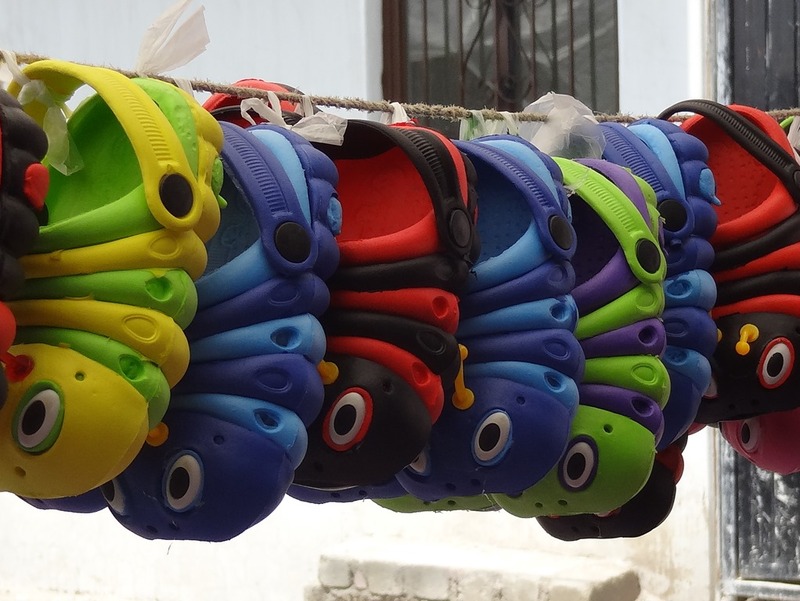 Kiddie shoes make an inverted centipede hanging on the line. We stopped here and ate. Two each of three different tacos. Good food, and inexpensive. 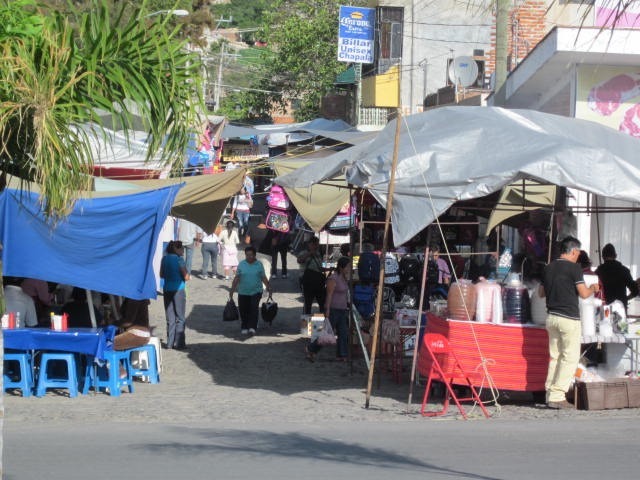 Coming from Ajijic, you would take Hidalgo, the main road into Chapala from Ajijic. 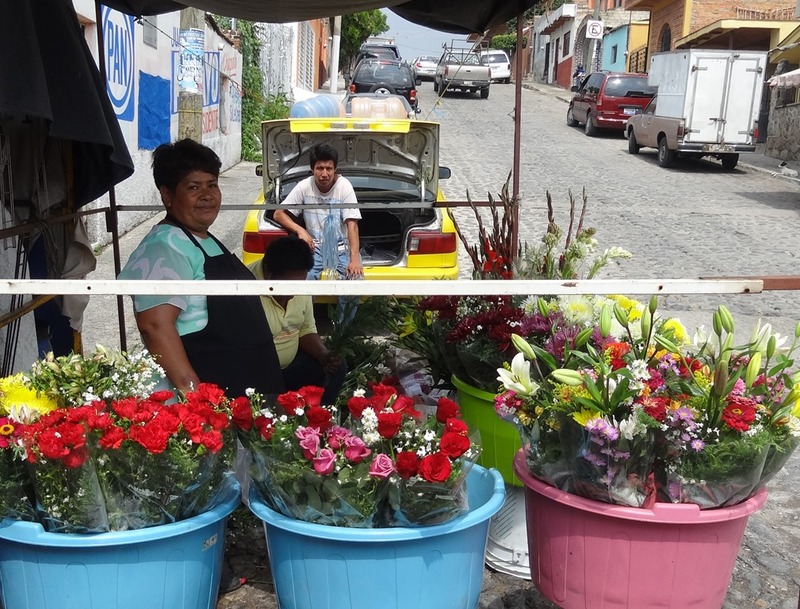 In Chapala, turn left at the signal, onto Francisco Ignacio Madero and drive 1.1 km. It is on the left. Now we know this market. Probably we will use it some rather than the Wednesday market. 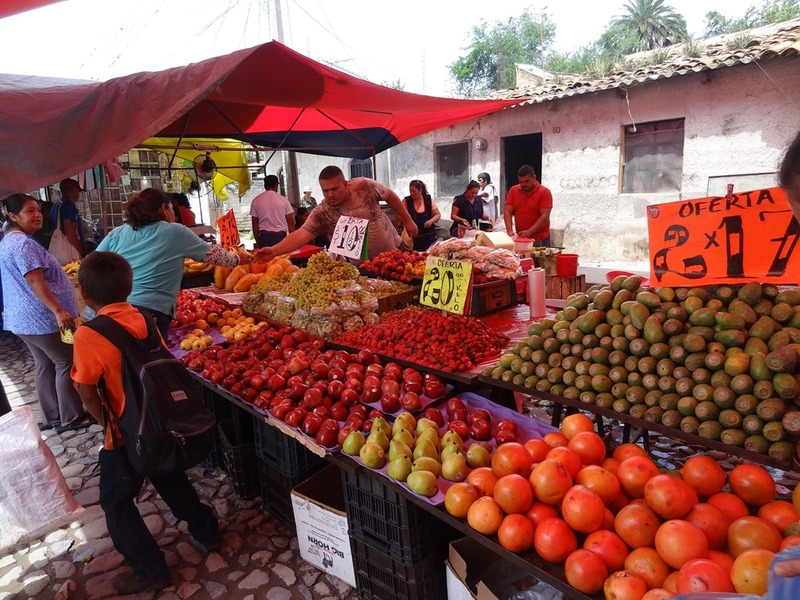 At least for fruit and flowers and a low-cost Mexican meal. 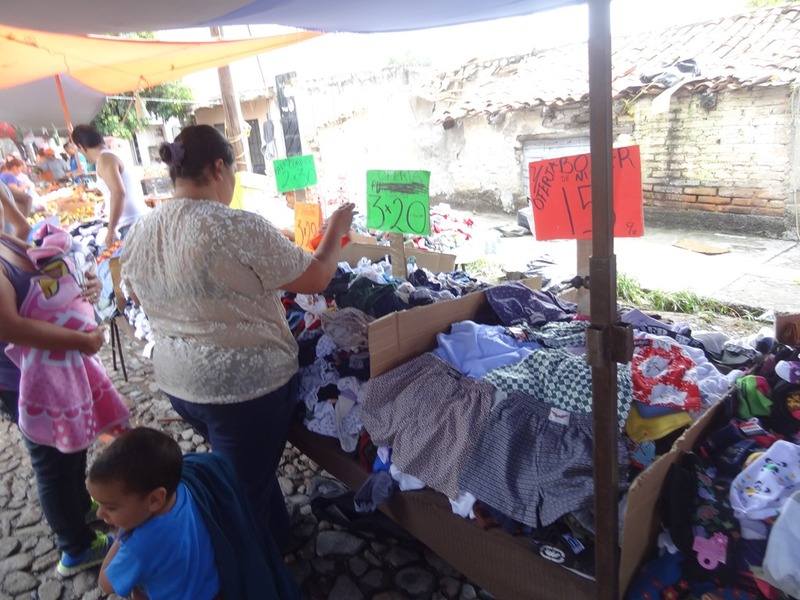 Maybe it’s a little cheaper here and we are also happy doing things in Chapala. 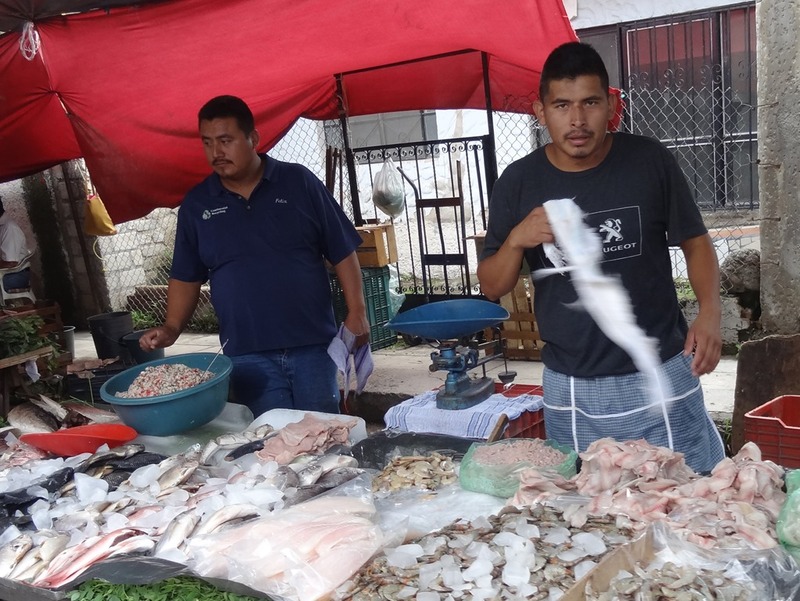 Chapala is is a lot more “Mexican” than Ajijic, with this tianguis as a good example, for locals, not Gringos (except for the more adventurous ones). 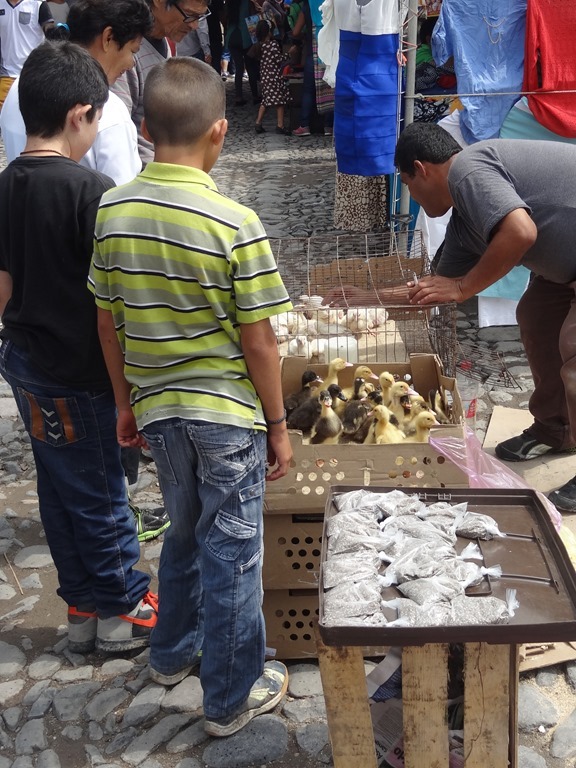 This entry was posted on July 9, 2015 at 2:30 pm and is filed under Ajijic, Lake Chapala, Mexico. You can follow any responses to this entry through the RSS 2.0 feed. You can leave a response, or trackback from your own site.